Why Doing More of What Works Might Help You Become Better Traders? It is a well known fact that traders are one-trick ponies. Does that have something to do with doing more of what works? I think YES. Being glued in front of the trading screens for a long time is tiring. Day-trading could be extremely stressful. Not following a strict trading plan is definitely a losing strategy in the financial markets. 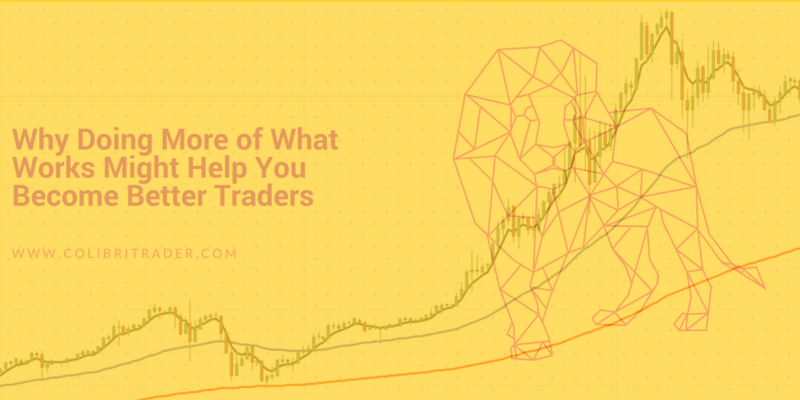 Why Doing More of What Works Does Help You Become Better Traders? Think about every time you had a successful trade. How did you feel after taking this trade? Excited? For sure! Now think about the time before taking the trade… Was the trade too boring to take? Maybe it was too obvious? Probably you were not even eager to take it, because you were too sure it would have worked perfectly fine. So, did you take this trade? IMHO, the line that separates “professional” or successful traders from losing traders stands here. It is the ability to realise that actually the boring trade, the obvious trade is the good one. It takes years of experience to reach this level. As I have said before, this is the Fourth Level of Trading. How to Do More of What Works??? This is the question a lot of you will be asking yourselves by now. There is something wrong with it in the first place. To start with, ask yourselves if you have a strategy that is really consistent. Be honest and admit when was the last time you faced your mistakes and accepted them as yours and did not blame it on the market. Challenges stand above other types of obstacles. They are exciting, they stimulate you to take action. But do you really need challenges as a trader? Do you really want to start checking other trading strategies if yours works like magic? Probably…not. All you need is a boring trade that works well almost every time. What you need is a money management system that protects you from risking more than 1-2% of your capital per trade. What else you need is a boring methodology that is there for you when you most need it. When you are taking a trade, it should feel natural- almost a second nature. Winning in trading is probably harder than any other undertaking. No wonder less than 5% of traders can make a living out of trading. It is not a handy statistic for a lot of brokers trying to get you to trade with them. But it is the reality. Time to face the music ladies and gentlemen! Are You Up To Becoming a Boring Trader? If you don’t know which way to achieve consistency, think about boredness. Try to stick to the good trades. But how to find them you will ask. Here is a list of questions to ask before committing to “boring”trades. Always be sceptical. Don’t be happy with one good trade. It takes a 1,000 trades (and 10,000 hours) to be able to define a good trader… at least. Be humble and never be over-excited. Boosted egos have been the reason for a lot of profitable traders to lose their fortunes. Even the famous Jesse Livermore has been citing this as one of his biggest obstacles in trading. Find pride in what you do, but don’t overexpose it! If you need excitement, start doing some sports. If you want recognition, do something good to a person in need. Trading is for the emotionless. The markets are a place where money is exchanging hands. Trading is a zero-sum game. If you cannot leave your bad habits behind, I promise you there is a bunch of traders waiting for that. So, you’d better join them and leave your ego behind. In the end, what matters is not how to become rich quick. It is probably not even how to become rich at all! What matters to become a profitable trader is probably easier than you think. The hard part though is o recognise it. On the other side, the problem with the recognition process is human nature itself. Once you are able to pinpoint that down, you are already on the next level of trading. Once you are there, you will realise how important it is to take another boring trade. You will realise why doing more of what works in trading might be your best trading guru! This is one of those articles that may be scoffed at by amateurs but bring a smile to a professional. In a way it is advanced but simple all in one. I clearly get it’s message and fully agree. Thanks for writing it up …. very important read ! One more god article worth reading. I seldom visit forums or reading news after I follow colibritrader. Colibri filters out for us what’s worth reading so we can fill our mind with what’s important. Not only for technical, but also out psychology – not only as trader, but also as better person. Thanks for the high evaluation Harry! It really means the world to me! Great article!! Without discipline, self-accountability and honesty with yourself you will not be consistently successful trader.